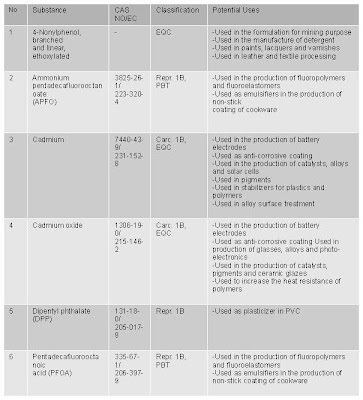 In June 2013, the European Chemical Agency (ECHA) updated the Candidate List of Substances of Very High Concern (SVHC) to include 6 more substances. The current list contains 144 substances which will be added to over time. Follow this link to see the SVHC list in full. According to the draft multi-annual work programme 2014 – 2018 which was published back in May of this year, ECHA expects to receive 50 substance proposals per year in this five year period. The table below shows the new additions to the list. To read this article in full, please visit the SGS website. The notification deadline for the 6 new substances added to the Candidate List is 20 December 2013.